A retired army general says he has filed a court case pushing for Egypt's historic Saint Catherine's Monastery to be demolished and its Greek monks deported on the grounds that they pose a threat to national security. In May 2012, Ahmed Ragai Attiya obtained 71 administrative orders regarding the demolition of the monastery's multiple churches, monk cells, gardens and other places of interest on the grounds, which he claims were all built in 2006 and thus not historic, according to Ihab Ramzy, the monastery's lawyer. However, in an interview with private channel ONTV on Thursday, Attiya said that he has now used the 71 orders to file an official demolition suit with Ismailiya's Administrative Court against the monastery and 10 of the Egyptian authorities concerned, including the president, ministers of tourism and antiquities and the governor of South Sinai, where Saint Catherine's is located. In the same ONTV interview, Attiya levelled a host of accusations against the monastery's monks, alleging that they have changed the names of landmarks in the surrounding area and tried to hide an underground water source known as Moses' Well (Oyun Moussa). 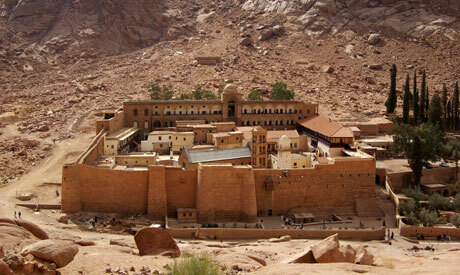 Most of the Saint Catherine's 37 monks are Greek. Attiya, who in 1978 founded the Egyptian army's special operations unit, made similar accusations regarding the monastery at the Journalists Syndicate in downtown Cairo in February. Ramzy, the monastery's lawyer, told Ahram Online that he denies all of Attiya's claims against the monastery and its monks. The abbot and monks at Saint Catherine's are not authorised to even paint a wall without permission from Egypt's antiquities ministry, let alone build new structures, Ramzy said, adding that the personnel on site are only there to guard the monastery. "[It's] one of the oldest, continuously inhabited Christian monasteries, with a history that can be traced back over 17 centuries, and is under the supervision of Egypt's antiquities ministry and UNESCO," Ramzy said. He said South Sinai's antiquities department had sent an official letter to Egypt's antiquities ministry, clearing the monastery of Attiya's complaints from 2012. Attiya, as the plaintiff in the case, has yet to provide evidence of his accusations. The court has since referred the case to an internal panel of experts to determine whether or not the monastery is indeed a historical place and if Moses' Well lies underneath the site. Attiya's accusations also include the Bedouin inhabitants of the region, who he claims have betrayed Egypt by guarding what he calls "the Greek occupants" – i.e. the monks. "The peace that has existed between the monks and the Bedouin people has made Sinai an emblem of peace" that has served pilgrims and visitors of different faiths, languages and culture, El-Jebaly said, speaking at a press conference last week at the headquarters of the Al-Tagammu Party in downtown Cairo. Regarding illegal structures, El-Jebaly said that the only "settlements" in the town of Catherine, near the monastery, consist of a housing project authorised by local authorities. Saint Catherine's Monastery was built between 548 and 565 on the site thought to be the location of the burning bush, where Moses is believed to have spoken with God and been told that he was to lead the Israelites out of Egypt. St. Catherine's was a place of peace for all people. It stands at a witness to the truth that all people seek God and that He can be found in the midst of the ways of the world. He should knock the Pyramids down as well and turn Giza into a skateboard park for Egypt's unemployed youth. All what we need from the great Egyptian army is to concentrate on their magnificent feet of riding the AIDS virus from the face of the earth and leave the politics to the non-scientists! I'm against demolishing or damaging the monastery, but: In spite of quarter a million muslim (foreign) residents, Athens is the only European capital without a single mosque. This is an irony in the face of history of friendly ties with Egypt and Arabs. Greek priests secretly sold hundreds of hectares of land in East Jerusalem to Israeli government. The transactions happened in the 1990's in violation to agreements with the Palestinian authorities. The Greek Orthodox church refuses to promote its Arab adherents, such as bishop Atallah Hanna, into higher posts. Egypt should adopt a sliding scale of measures, from insisting on certain percentage of Egyptian monks adherents to the Greek Orthodox church; putting the monastery under joint custodianship with the Egyptian coptic church; up to the full custodianship of the coptic church. Egypt should most definitely not develop any kind of sliding scale on which to base its own freedoms. Instead, Egypt should strive to become a beacon of freedom. By doing so, it will not only help itself; it will also help dispel hardness of heart in other places as well. Darkness can only be driven out by light. General Ahmed Ragai Attiya and people like him caused all the troubles that Egypt is facing today. The paranoia, lack of common sense, hatred and stupidity kept tourists, foreign investment away. I hope the new Egyptian leadership keep people like far away from any sensitive important position. I read this news in shocking manners he must be insane to express such thought the Sinai is holy land and belongs to all mankind. Prophet Mohamed assured the protection of St.Catherine. This retired army general will NEVER get his wish as St. Catherine's was promised to be protected by the Muslim Prophet Muhammed under the Actiname of Muhammed.